At the weekend I took delivery of my two new Samsung SyncMaster 205BW monitors which are fantastic. 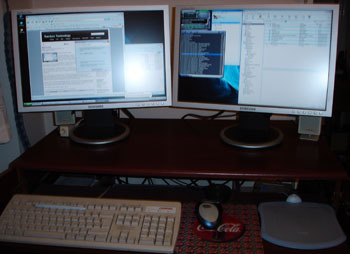 I’ve had a dual head setup for about the last 4 years but always as a couple of different size & resolution monitor. I’ve always thought it was a great improvement from a productivity point of view and would never choose to be on one monitor again, unless it was a nice Apple 30" plasma (but saying that for the price difference between my setup and the Apple 30" I’d stick with my current setup). The new monitors were a massive improvement over my old setup, unbelievably bright compared to my old CRTs and obviously a lot bigger in every way. My desktop space is now 3360 x 1050 pixels that’s over 3.5 million pixels for me to play around with, or in other words it’s 83.6 centimetres or 2 feet and 10 inches of horizontal visible screen! The productivity improvements by the extra space have also been much more than I was expecting, I can now easily work with 3 or 4 documents open side by side in Eclipse, which is great when I’m working on stylesheets for pages as I can have the source & all the appropriate stylesheets open at once. Another improvement that I wasn’t expecting was in terms of sound quality, not because the monitors have built in speakers but because I now don’t have two huge lumps of plastic and vacuum tubes on my desk interfering with the sound from the speakers next to them; its a massive difference. One thing more thing I expect to improve in the long run is my neck strength, as I have to physically turn my head to move from the far left of the screen setup to the far right.